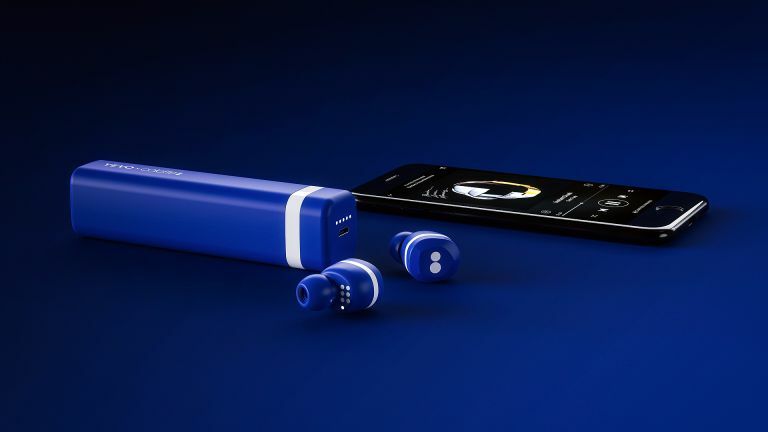 YEVO x Colette: are these the most stylish true wireless earphones yet? True wireless earphones are a hot area in tech right now, ever since Apple's AirPods blew up. That's 'blew up' in the good way; they aren't a 'hot area' because they keep exploding in wearers' ears. That would be bad. True wireless buds haven't generally been the last word in chic, to date, but with the YEVO x Colette collaboration, that all changes. It's Swedish design DNA meets Parisian style. And it's very blue indeed. In their existing ivory and onyx colourways, the YEVO buds – from the same stable as the Happy Plugs lifestyle earphones and cases – already look pretty chic. They're 'inspired by faceted precious metals and smooth shapes… to deliver advanced technology in a sleek and sophisticated way.' Obviously. Now, Parisian boutique Colette has added a splash of colour with a limited edition pair in its 'trademark Colette blue'. The buds remain lightweight at 8g despite the fashionableness of the paint job, and a choice of six sizes of ear tip should ensure a comfortable and secure fit. Leaving you free to skateboard, do yoga, attend gallery openings and browse smorgasbords. YEVO's in-ear, wire-free, chic-AF headphones claim to be in the 'hearables' area, rather than being mere music earbuds. Possibly that's pushing it a bit, but there are features such as 'Audio Transparency'. This lets sound from the surrounding area through at the touch of your finger. Further touch controls manage volume, taking phone calls, skipping tracks and calling up Apple Siri, Google Now and even Microsoft Cortana, for those ultra-'exclusive' users of Windows Phone. An iOS and Android app also – hey! – gives you freedom to do your own thing, customising EQ, Audio Transparency and what the touch controls do. Battery life is alright, by true wireless standards, at four hours per charge. The chic case can then top that up five times while you're on the go, skateboarding, enjoying something 'experiential' or checking into a boutique hotel – and that is actually much better than average. Musically, we're promised that, "Balanced armatures from Knowles," deliver, "a safe, crystal clear audio quality, fine-tuned to hit those crisp highs and deep lows for a fully mesmeric experience." Okay. YEVO uses NXP's Near Field Magnetic Induction (NFMI) tech to pair the buds with each other. Born out of the perhaps slightly-less-glamorous hearing aid industry, NFMI is power-efficient over short distances, but the signal strength then tails off sharply, meaning nobody can listen in. Bluetooth 4.1 is used, as usual, to connect to your phone or other compatible gizmo in the first place. You can only buy the blue ones from the Colette store on Rue St Honore, we're afraid, but the standard editions are yours to buy online, for €249 (about £210).